Perfect mild climate, colorful architecture, hospitality, walking city great for shopping and people watching, folkloric tradition, culture and arts, food and historic sites...so its pretty much got it all except for la playa. "Oaxaca es el mas hermosa", my friend told me, "and if you want to learn Spanish, it’s the best place in Mexico". Well, he didn’t have to convince me, I've traveled to many parts of Mexico and I have never been disappointed with what it has to offer. With excitement and expectation I booked my maiden voyage to Oaxaca. With the help of my boyfriend, Senor Google, I found a school for Spanish there and was ready to embark on a one week cultural immersion with my teenage son, who will be going to college soon. This will be the first time for us to go to a school in Mexico, and instead of hotel, we chose an option of "home stay", which was offered by our school. This means that we are staying with the family, eating breakfast and other meals together with them and other students who are staying there as well. I am an ambitious person because I chose full immersion, which includes classes in the morning from 9 to 1, and a workshop in the afternoon from 3 to 6. The plan is to improve our Spanish AND to learn more about Mexico so a full day should do the trick. Oaxacan architecture can surprise you with beautiful details. We are so happy to be walking and jumping. How did we prepare for this trip? Two months before this trip I studied with Rosetta Stone app almost every day for about 30 min. I also studied and learned few songs in Spanish. One on them was recommended by my friend Rafael, it’s the beautiful “Sabor a mi” by Los Panchos y Eydie Gorme. This one was my favorite, so I memorized the words (not an easy task in a new language) and learned it on the piano as well. My son has been taking Spanish in school so our level ended up being pretty close. My native language is Croatian, second is Italian and third is English. I believe that this gives me a bit of advantage, even without formal schooling in Spanish. Not to mention that I am a talker, and not much of a perfectionist, which gives you an advantage only in very few things in life, this being one of them. We arrived to Oaxaca from Houston late Saturday night. I was in love from the first sight; as soon as we came out, I was charmed by the perfect temperature and a perfect night outside. Goodbye Houston humidity and boiling summer temperature! Hello perfect mild climate of Oaxaca! A taxi took us to the city, which was alive with people walking the streets, hanging out in bars and cafes, just like in Europe. Ahhhh, que bueno! My son wanted me to stop expressing my joy, comparing it to Croatia, etc. but you are who you are, and my son just had to live with it! Our home stay mom was at the gate to greet us and show us our room. It was a simple room with two beds, in one of her casitas, part of a big concrete complex, complete with a big friendly dog - Apollo and a great grapefruit tree with huge fruits. I managed to make my first joke in Spanish by telling our hostess that if one comes home drunk, they might mistake that fruit for their wife’s head? It worked, because AnaMarija and I are now amigas. Her name is the same as my sister’s and her food, especially her soup is like my mom’s, really deliciosa! Oh how the colors of old buildings in Oaxaca shine and make you happy! The next day we started with a juicy watermelon, my favorite fruit, followed by yummy tostadas breakfast. We met other students who were staying there as we gathered for breakfast. We made fast friends with Ian from New Orleans and we went out to town with him that day. We learned quickly that the town is very close by, a pleasant walking distance. We live behind the hospital and a bank machine is safely and conveniently located inside this lovely hospital. Oaxaca’s streets blossomed in front of our eyes showing us more colors then we could ever imagine, vibrant with life, this is Mexico! If you love architecture and color, you have to see Oaxaca! We went to a beautiful cafe nestled in a patio of an old building. We had popular local chocolate drink and we watched the World Cup soccer there. The whole cafe was rooting for Croatia which made me feel especially welcomed there! Santo Domingo church in the Center of Oaxaca impresses you with its shiny gold interior. Like most beautiful cities in Europe: Florence, Zagreb, Split or Prague (my four favorites) you can see the whole center of the city on foot. This is so very pleasant, not to have to use a car! Me gusta caminar! I love walking! And I like shopping! These two activities work in perfect union in Oaxaca, a city rich in arts and crafts markets and vibrant shops all selling beautiful hand made traditional indigenous clothing, ceramics, jewelry and art. I am so drunk absorbing the colors of the architecture and clothes, that it becomes a hard decision, which color and-or style to choose. I enjoy this feeling, it’s a bit of an adrenaline kick, plus I inherited a good ability to communicate and negotiate in markets from my Croatian dad. I bought three peasant style dresses from an old man who knew all about Croatian soccer success. We discussed everything, from sports to culture, color, style, all in my almost intermediate Spanish! He even managed to first console me, then convince me that silver is just as good as gold, especially for such a tiny country like Croatia to win its first silver medal in Soccer...Yes, Shopping is really fun and uplifting experience in Oaxaca! If you love a great deal on hand made ethnic style stuff as much as I do, you will be in heaven. My son at ICO, with the friendly school director, Senora Lucero. Next day we started our Spanish classes at “Instituto Cultural de Oaxaca”, or, as the students call it, ICO. 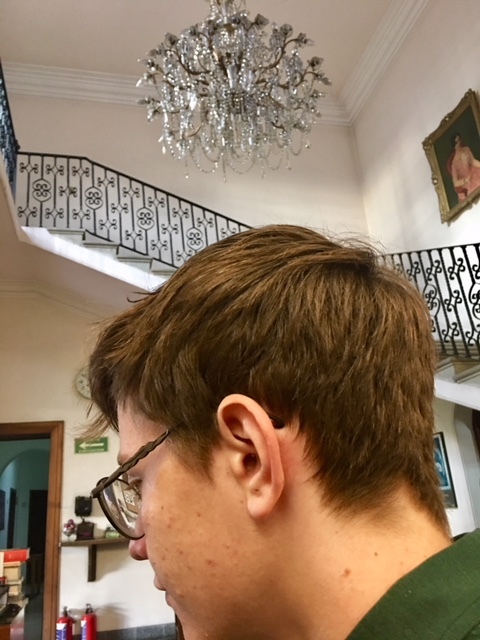 What an impressive building our school was; Everything from the grand chandelier at the reception to charming classrooms or salons was decorated with Oaxacan traditional tapestry, it was all so tasteful, traditional and very comfortable. The lady I communicated with prior to our arrival was this school’s owner and founder. My instincts were good when I picked ICO for us because, out of many language schools in Oaxaca, this one is the oldest and the best. Senora Lucero’s grandparents used to live in this beautiful villa, and she used to play around here as a child. I will always remember how my voice echoed naturally when I sang to her “Sabor a mi” in the grand foyer and maybe, just maybe she might remember it too? Our home stay house had a piano so I played this song for them, and I was surprised how much they liked it... I found out at the end of the week, from our cab driver Jesus, that “Sabor a mi” is a song written by Oaxacan composer, Alvaro Carrillo. Well, another weird coincidence? Should I really return and live in Oaxaca? The more I find out about it, the more I am in love with it. The grand foyer and the reception area of the school. My son and I were tested and marked as the same level in Spanish, not total beginners, something like early intermediate, so we were put in the same class. This was not the case with all other students who came as a duo. Call us lucky? Hehe. There were 8 of us in class and our teacher was a young gentleman, Mr. Gonzalez, a wonderfully relaxed and cultured person. He was successful in making us all feel at ease in speaking and communicating in Spanish. But, more then that, he thought us about Oaxaca, it’s traditions, culture and it’s famous people. One of the famous Oaxacans was Mexico’s great former president, Benito Juarez. We see his name everywhere in Mexico, including Mexico City airport, which is named after him. Our classroom aka salon decorated with local tapestry. Streets of Oaxaca are alive during folk festival known as Guellaguezza in July. It was the third week in July and Oaxacan tradition of Guellaguezza was just around the corner. We were lucky to experience the start of it: endless parades of marching band music with religious images symbolic for each different indigenous group from all different parts of the grand state of Oaxaca. Followed by people dancing to the beat, all dressed up in vividly colorful costumes while big sculptural puppets danced theatrically through the streets. This is the great fiesta de Oaxaca, one matched only by the great Dia de Los Muertos at the end of October. It’s noisy, it’s crowded, it’s happening, it’s colorful, it’s from the people for the people, and as they say, it’s “Una locura” (craziness). While dancing and trying to navigate through the crowd to the beautiful Santo Domingo Church, I find myself studying the fantastic art of some really captivating street graffiti. My teacher explained political and social background of the images I capture. I love how this art form is not just artistic but also socio-political, historical and culturally informative! Oaxaca is a city rich with folkloric traditions, culture, and arts. Oaxacan artists decorate the streets with socio-political and powerful artwork. My son convinces my to sign up for a traditional cooking class as our afternoon workshop. I am so glad that my son chose food. I was considering taking salsa dance, but he told me that food is better then dance because we will learn more about the language and culture through food. We found grasshoppers as one of typical foods in the markets the day before, and this made me a bit apprehensive, but I am so glad that we choose food. It was really the best bonding experience for the two of us, as well as culturally the most important experience in Mexico. Also, I was grateful that we did not cook anything with grasshoppers. We learned to make a fabulous local mole, yummy molotes and the Aztec soup all from scratch. This experience was heavenly. Our teacher was relaxed yet informative and friendly, very much like all the great people of Oaxaca. We made tortillas using tortilla machine, making many a bad one before success. We even created a song about tortillas, as we learned so much about Mexican culture through cooking: Its plants, its mixtures and its intense taste (sabor) will stay with us forever. And when we want to remember it, we can use its recipes? My son and I agreed: This was some of the best cuisine we have ever tasted. Que Sabor! Despite the fact that our cooking was labor intensive, my son and I were able to experience the true taste of Mexico: rich in flavor, authentic, colorful and artistic. “Sopa Azteca” is done at our cooking workshop. Our teacher says we are good “cocineros”? Last day of our trip, we went to visit a historic site Monte Alban. It’s a half hour ride up the mountain. An ancient civilization Zapotecas lived there BC. It is majestic but Zapotecas had a cruel ritual of sacrificing children to their God. We do not know why because we are not history buffs and I am sure that this can be looked into with my boyfriend, Senor Google, if one is interested in learning about this in more detail. Alternatively one can purchase a tour of Monte Alban to find out more about this fantastic historical site. We chose to just walk freely and soak in the beauty of the site. My son was investigating and discovering ancient and mystical looking bugs at the site: insect adoration was one of his favorite activities when he was little… There is a nice gift shop, a great museum and a fantastic little café there overlooking the mountains, decorated with colorful flowers, inviting you to daydream about the past and the future, while enjoying the beauty of the moment. Photo by John Parani. An interesting bug at the historic site of Monte Alban near Oaxaca. Monte Alban, the historic site near Oaxaca. Some places you visit stay in your heart forever and you know that you want to see them again because you want to reconnect with the people, the food and the culture once more, desiring to open more doors, cook more meals, and make the experience deeper, and the connection stronger. In the meantime, while your daily life goes on, during those hypnotic meditative moments, you know that you will go back to those special places and experiences of Oaxaca. So I say “Hasta luego Oaxaca!”. See you later. The sooner, the better! And grazias por todo. You are forever in my heart and in my taste. I am yours. A butterfly inside our classroom decorates beautiful traditional tapestry on the wall. I invite this butterfly into my dreams. Oaxaca is already there.